This holiday season, you've decided to finally take your Secret Santa duties seriously. Whether you're exchanging presents amongst a group of your closest friends or participating in an organized exchange with your coworkers, you know that you want your gift to be more memorable than that fuzzy red beanie you bought at the last second last year (which didn't exactly garner a heartwarming response). If you're looking for a gift that will make an impression, why not consider going the DIY route? Even if you're slightly horrified by the mere idea of handcrafting something (like me), don't stress. There are countless online resources out there that make pulling off these kinds of DIY projects pretty easy. You'll become an expert in no time, and you might, dare I say, even end up enjoying yourself in the creative process. The best part about making these presents yourself is that you can tweak certain elements to make them suitable for just about anyone. Use a different color scheme, add your own pattern, or toss in some extra accents to make it more relatable to the person you're giving it to. They'll appreciate the thought and effort you put into it, no matter what you choose to create in the end. And one more thing to celebrate for those of us on a budget: making DIY gifts is cheap. So procrastinate no longer! Here are 19 DIY gifts perfect for your next Secret Santa party. Whoever is getting this gift is about to have some extremely cozy at-home movie nights. The ingredients for this cocoa mix can be bought at any grocery store — just use a blender or food processor to put it all together. And the tutorial also provides free printable tags, to add a sweet personal touch. Everyone loves Sriracha — which means everyone loves Sriracha salt, especially when it's handmade. The only two ingredients required are — you guessed it — Sriracha and salt. Pick up some wax parchment paper and a 13 x 9 baking dish, and you're good to go. This isn't a last-minute kind of project, though, as it takes a couple days for the mixture to dry. This adorable takeaway pie box hardly takes any time to put together, and you don't need to be the world's craftiest person to pull it off. Print the design straight from the website onto cardstock paper (they recommend 65lb cardstock), and follow the easy directions to cut out the proper shape. Perfect for taking home the leftover apple tart from the office Christmas party! Plain ol' gingerbread cookies are great, but you want something with more dazzle when it comes to gifting; and you can't really shove a gingerbread house into a gift bag. Up the wow factor by turning the classic holiday dessert into a sophisticated Christmas display — a display that can be eaten whenever the giftee feels that the time is right, that is. Fulfill your fantasy of playing with glittery sequins for hours on end and make a beautiful gift. It may not be the easiest DIY project, but it makes a really special present, one that your giftee will probably proudly put on display in their home. Spread the work out over a couple of sittings so you don't feel rushed. And while the ombre is a beautiful touch, feel free to experiment with other patterns too, like dots or stripes. Any woman who has ever experienced menstrual cramps deserves to be on the receiving end of such a useful gift. And remember, you can choose any pattern you want, so if the flowers are a bit too cute for the recipient, go with something edgier. These geometric coasters are as festive as they are practical; they can be used individually for mugs and cups, or you can put them together (yep, like a puzzle) for something a bit bigger, like a French press. Opt in for this one if you're not looking for a serious DIY challenge. Adjust the color combination to make it a perfect for a friend who needs to add a layer of cool to their apartment. Enchanting and tasteful, these votives add just the right amount of charm to anyone's home. It's very important, however, that you instruct the giftee to use battery-operated tea lights rather than wax candles in these votives — you don't want your lovely creation to be responsible for a fire hazard. You might consider including a battery-operated light as part of the gift, too. These cool tea tins look like they're straight out of a catalog, yet they're not that difficult to put together. 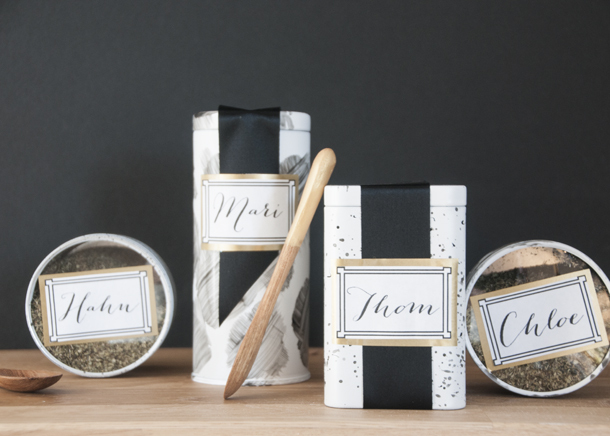 Either fill them up with a loose leaf tea you know they love, or let them make the choice after they've unwrapped it. They're ideal for the chic tea-drinker who will appreciate this extra bit of style in their kitchen. Being selected as Secret Santa for a dude you don't know all that well can be rough. Who knows what Nick from Payroll is into? But this homemade aftershave is a good bet. Made from only three natural ingredients, you can also package it with the free labels that come with the tutorial. His partner may well be the one to mail you a thank you card for this one. So kitschy, right?! They fit superbly on someone's office desk or at home in the foyer. Don't forget to mix it up when it comes to the sizes of the marbles, to give the trees a festive-yet-casual feel. These darling hair pins will bring joy to the woman in your life who knows how to rock a hair accessory. Even when they're not being used, merely displaying them adds some cheer to the environment. Make a handful of them, and maybe she can share a few with her roommate, partner, or daughter. Encourage someone special to keep nurturing their sweet tooth. Print the stencil for free from the site and use yardstick paper if you can get your hands on it. This also gives you a fantastic excuse to experiment with your chocolate cake baking skills. If your secret santa giftee is into minimal accessories, she'll dig these earrings for sure. Lucky for you, they're pretty easy to make. You can choose to add any color at the top; or you can simply leave the paint out of the project and stick with the purely wooden look. Either way, they will enhance her one-of-a-kind flair. Choose two patterns you think would best go with your giftee's personality, but make sure they're both cotton. You'll need a sewing machine to pull this one together, so if you don't have one at home, ask to borrow one from a friend. You may be tempted to keep this one — don't worry, you can whip up one for yourself after the holiday season calms down. Bath and body products are among the most popular gifts handed out in Secret Santa exchanges. You can make yours stand out, though, with these carefully crafted homemade soaps that combine the most festive scents of the season, including cloves, cinnamon, nutmeg, and coffee. Your giftee needs something that adds character to their kitchen, and a new frying pan just won't do the trick (plus, it probably falls outside the suggested price limit for your exchange). The free stencils available in this tutorial will spice up any kitchen towel — and feel free to fool around with different colors, depending on who you're gifting them to. These bookends have a composed, urban feel to them, and they make a great gift for anybody who likes to read. If you want to get really crazy with it, paint them each in a different color. It's the simplest things that often make the very best Secret Santa gifts. I mean, how many people do you know have a laundry bag that looks this first-rate? Practical for the city life (where getting clean clothes often means lugging a load of laundry up and down the stairs), it's a gift that will stand the test of time.